Welcome to the Classic Castle Progressive Vigstory. It is simple. 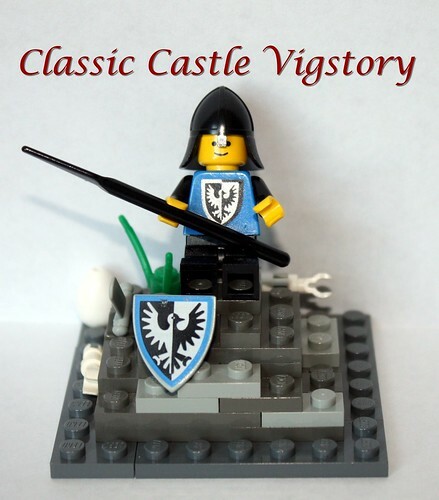 We start with a simple vig and build a vigstory around it. I will start by introducing our main character in a vig. Then someone calls the next vig…we wait until they build. And then someone calls the next vig…repeat. Calling the next build is important so the story doesn’t all of the sudden have two directions it is going off in at once…leading to much confusion. Progressive stories can be epic levels of fun. You don't have to be part of it from the beginning to jump in. Limiting it to a vig will allow quick movement and not require huge time commitment and extensive writing. 1) You can add new characters, but please don’t kill off another person’s character or our main character. Killing off characters other than your own hurts people’s feelings. This is for fun..not to hurt people. 2) Build a vig to tell your addition to the story…no size restrictions, no building restrictions. 3) You can write 1 or 2 paragraphs to go with your fig. I call the first vig...since this is my doing and all that. I'm keeping it simple and vague so we have places to go. Meet our young hero Sir Falcon d'Black. Falcon was just very recently knighted. He is young and ready for adventure. What you see is what he owns, one sword, one shield and a spear. 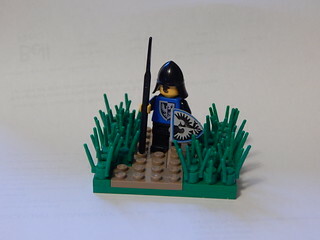 On his first official day as a knight, Sir Falcon d'Black finds himself in the middle of a rocky outlook by the castle not exactly knowing what he is supposed to be doing. So he sits down to ponder. Sir Falcon d'black realized he was wasting his life away on that rock, so he got up, and started walking across a well beaten path. But he isn't the only one. He spies someone up ahead! Sir Falcon d'Black encounters a strange man, huddled over a chest, with an anxious look over his face. Just before he introduces himself, he spies a shiny key in the long grass, out of view of the man with the chest. He quickly tries to think of something to say. Every aspiring champion of the realm knew the most proper and noble thing to do, was retrieve the shiny key for the distraught nobleman. And so Sir Falcon d'Black did just this. Unexpectedly, he received a hefty reward purse of gems and coins from the elated nobleman. And so the two parted ways, with Sir Falcon d'Black taking his coin purse and purposing to take his newly acquired pouch of coin to the local village festival. Adventures and festivities surely await!